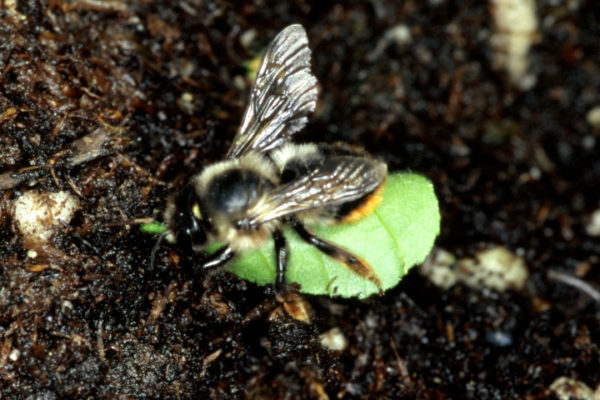 When do Leafcutter bees emerge? 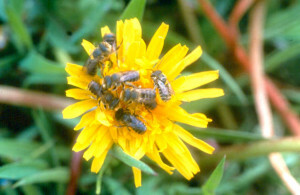 Leafcutter bees are great summer pollinators. 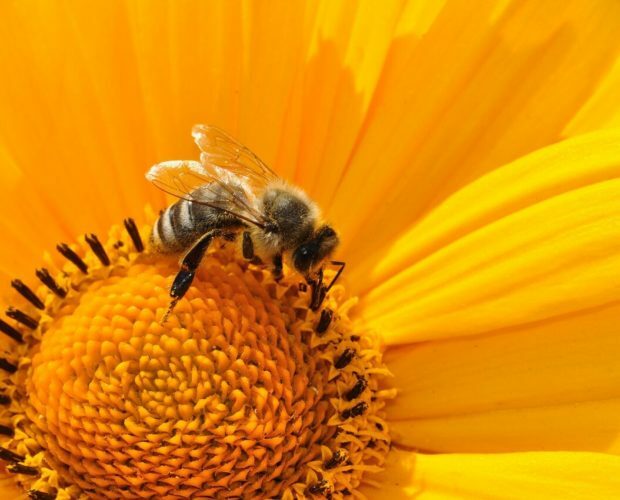 It is easy to start with these bees. All that is required are bee cocoons, a suitable nest and some hot summer weather. 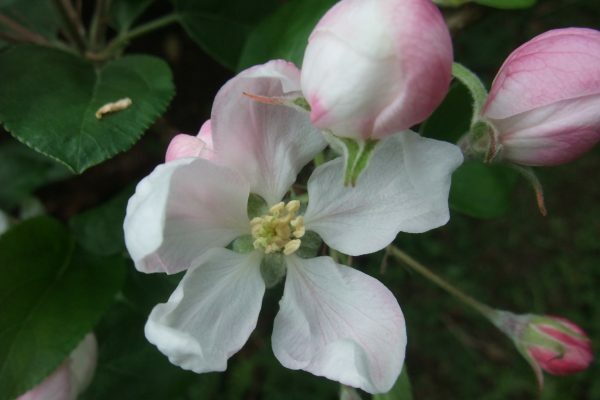 Many of our customers have started their new hobby with these great little summer pollinators. But it was not clear how long these bees needed to develop into adults and emerge in the summer. 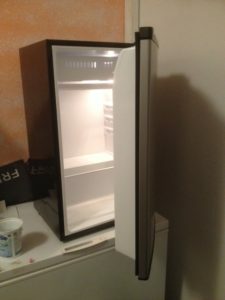 We heard of people throwing them out, cutting them open and finding a fleshy grub that does not look at all like a bee! Here are the facts. Under laboratory conditions and inside an incubator at 30C, bee pupae need 20-31 days to emerge as adults! This is a long time! This means that under normal conditions (and about half the time it is night and temperatures are cooler) the emergence time is much longer than 21-30 days. Under any natural conditions, emergence is more like 30-45d+. They say ‘Patience is a virtue’! 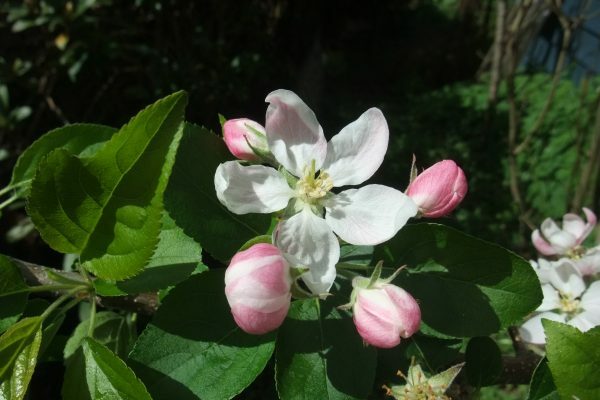 Twenty two species occur in Western Canada. Megachile rotundata is a species of leafcutter bee that originates from Eurasia. It is used in the commercial seed production of alfalfa. 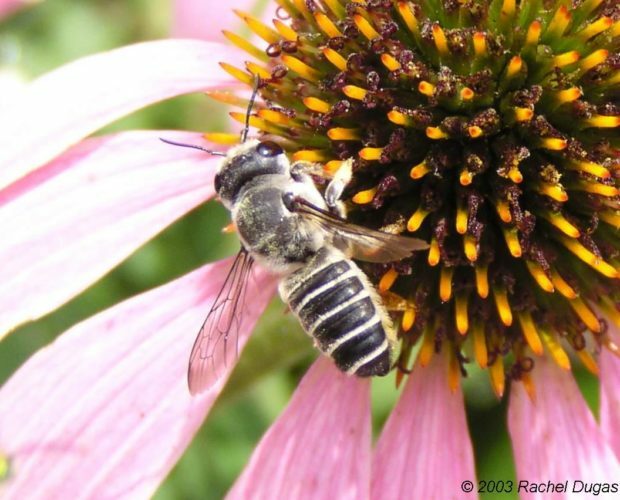 The female Megachile rotundate has silvery gray hairs on the underside of its abdomen. 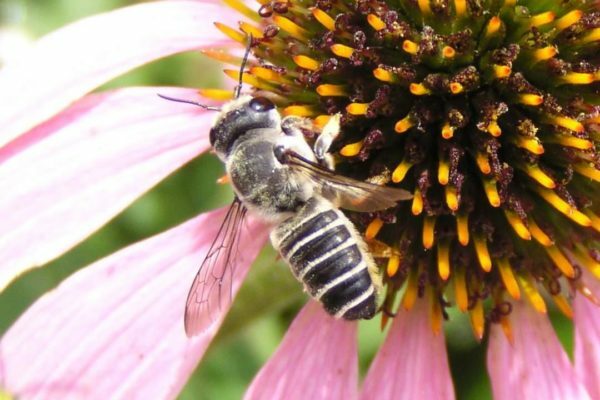 Other female leafcutter bee species usually have golden, tan, or black hairs on the underside of their abdomen. Megachikle rotundata overwinters in the pre-pupa stage. 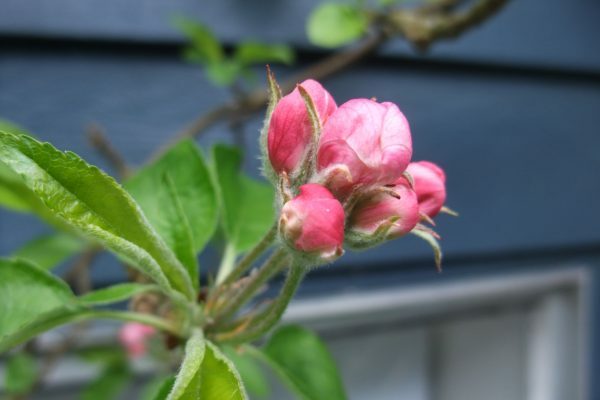 during last spring and early summer, temperatures are sufficiently warm for pre-pupae to develop into adults. 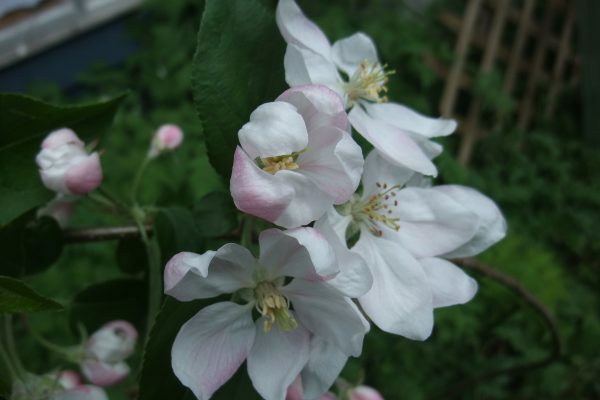 Then adults emerge to pollinate our summer blooms. 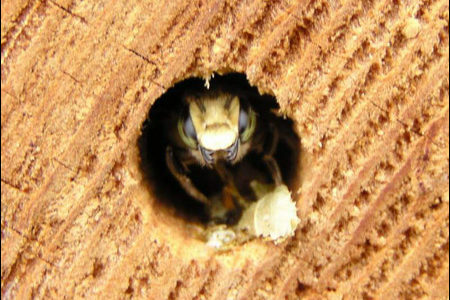 Nesting material for leafcutter bees were first made out of grooved wooden pine boards that were stacked to make a series of nests. 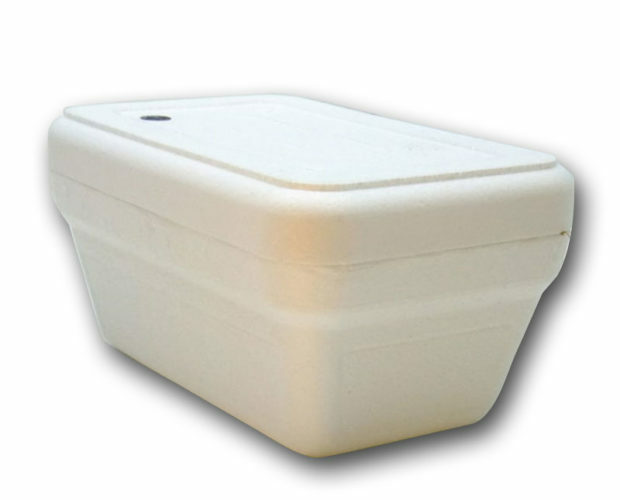 Polystyrene grooved boards and nesting holes molded into solid polystyrene blocks are both used today. 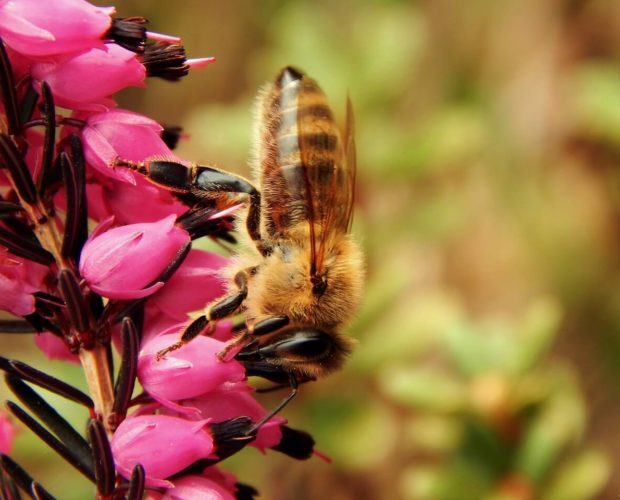 In part, excerpted from our book ‘Pollination with Mason bees” page 100 by Dr. Margriet Dogterom. Get yourself a copy as 25,000 others have done. 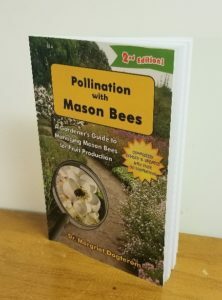 It is the standard management guide for mason bees and includes details about other bee species. What is this Cotton fluff? 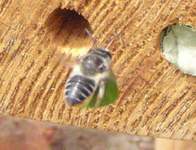 Leafcutter bee emergence-a full report and more! 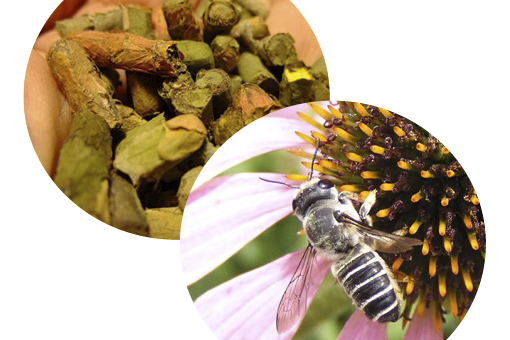 The first thing I want to mention is that I did compare your Canadian leafcutter bees to some leafcutter bees purchased in the United States. 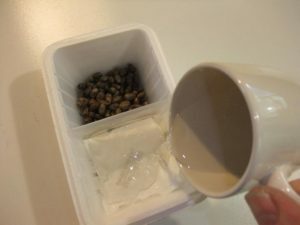 I incubated both sets of bees under the same indoor conditions where the leafcutter cocoons were placed in plastic petri dishes with a plastic lid that holes drilled in it for air circulation. I also had an internal temperature probe in each dish to monitor the temperature, and both temperature and humidity were recorded on a daily basis to an Excel spreadsheet. I also took notes and put them on the spreadsheet as I examined a few cocoons over the incubation period. 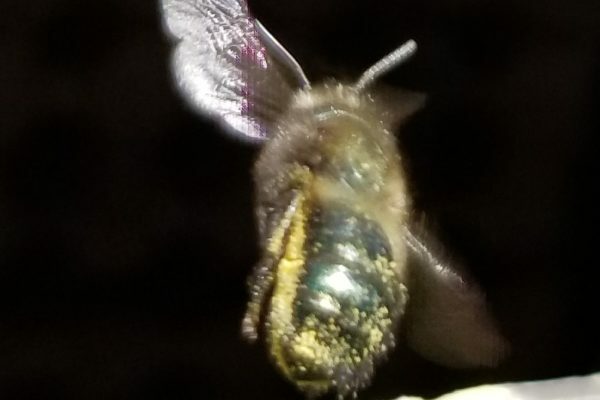 My results on leafcutter bee “emergence” rate would support what has already been published in the literature (see PDF). 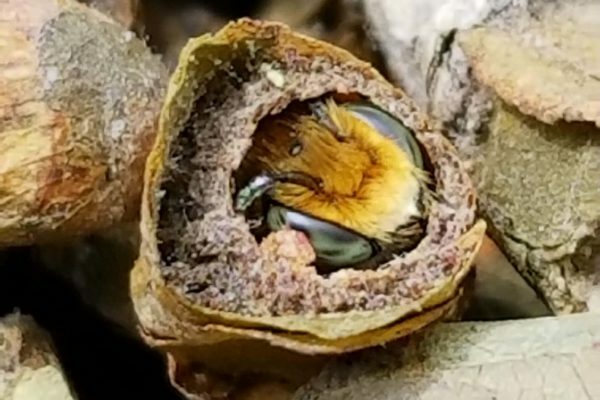 That is, under my incubation conditions I found that the Canadian bees were much better than the U.S. leafcutter bees in the percentage of bees to emerge. That is, I had 99% of the Canadian leafcutter bees as compared to only 55% of the U.S. leafcutter bees emerged over the same time period. The other thing that I found, which I would do different next time, is that the required temperature of 86oF (30C) for the bees to emerge by 28 days is probably very critical. 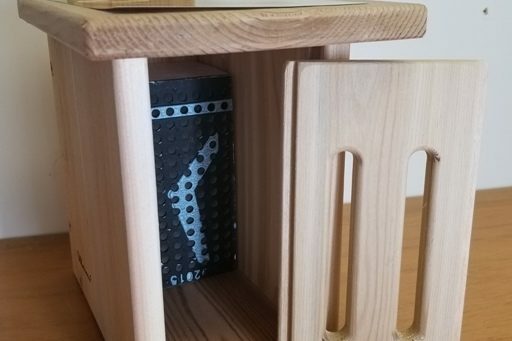 When I received both your bees and the U.S. bees at the end of May, I decided to try and incubate them inside my house where the temperature is more constant. 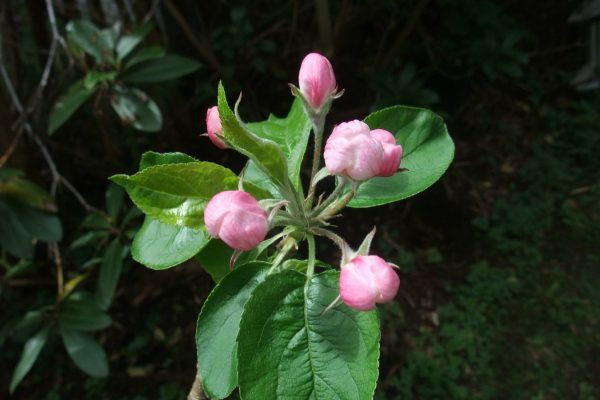 During May and June in the Portland area we still have wild swings in temperature where it can be 64oF (17.7C) for many days or weeks in May and June. 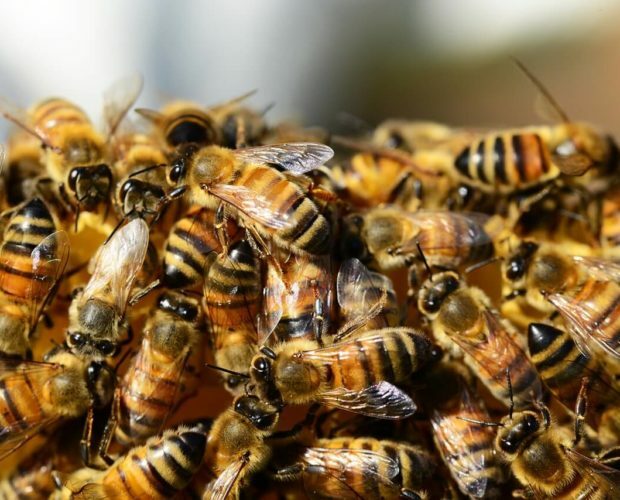 With the indoor incubation I was only able to maintain an average daily temperature of 76F (24.4C) as compared to the needed 86oF (30C), which resulted in the bees only beginning to emerge (the males) at 30-32 days instead of the standard 18-20 days. Fortunately when the first males began to emerge I put them all outside and our daily temperatures were then in the 80-85F (26-29C) range. Again, despite the longer incubation time I still had nearly all the Canadian bees emerge as compared to only about half of the U.S. bees emerge over this same time period. 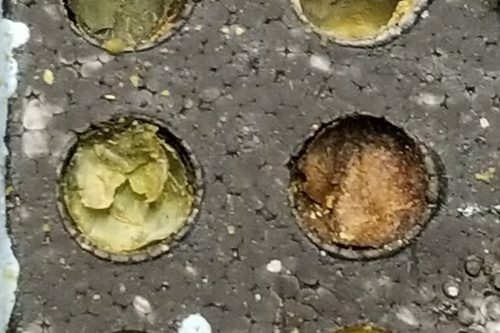 The retention of the leafcutter bees was a surprise to me in that only 5% of the Canadian and none of the U.S. leafcutter bees decided to take up residence in my nesting box area. 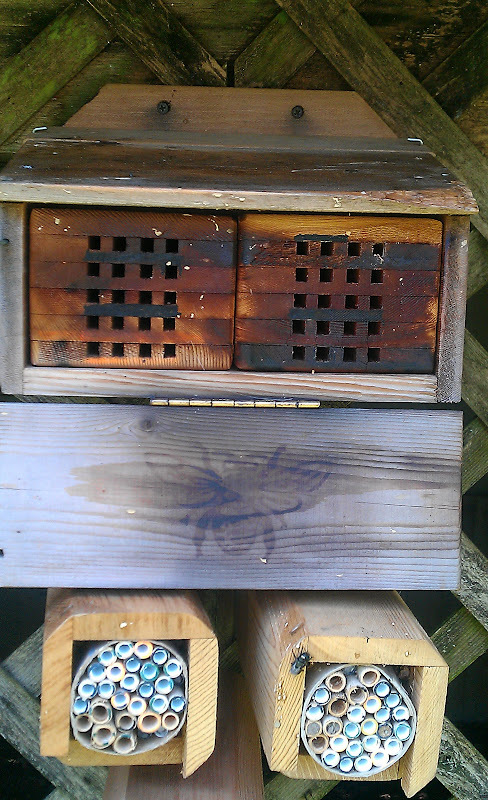 Where I put the bees for release was actually within the middle portion of my Mason bee nesting structure (that faces East), and it contained many empty round tubes with and without papers liners, two of your corn stacked-systems, and many of the natural reeds at various sizes. 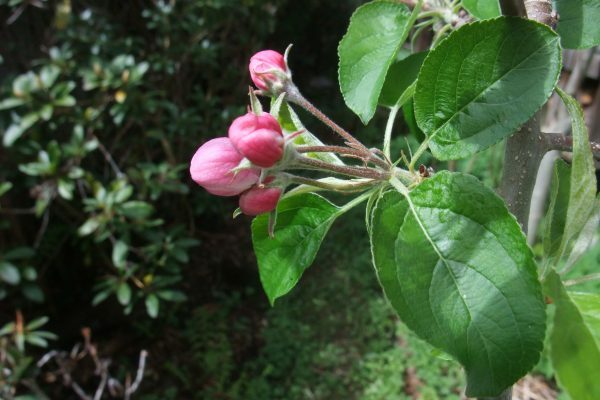 Also, on the other side of my nesting box are rose bushes, a big lilac tree, azaleas, a redbud tree, and many other plants that leafcutter bees are supposed to like for nesting material. We also have a very large Wisteria plant that actually hangs near my mason bee nesting area, and I could find many of the leafcutter bees on the Wisteria flowers as well as on other flowers all around my house. However, despite being in close proximity to my nesting box on the flowers that very few bees decided to take up residence. 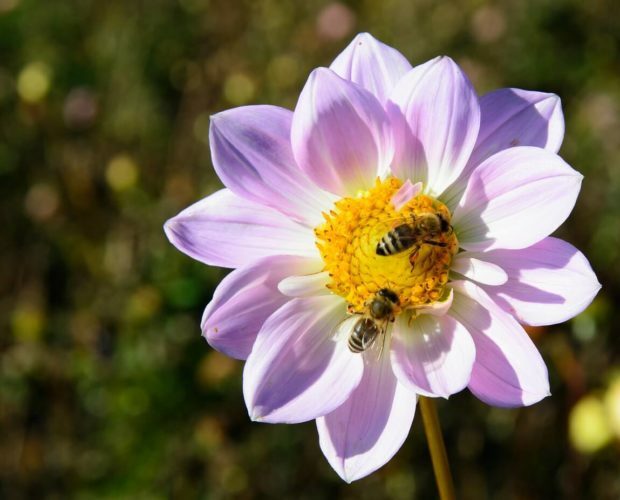 Wherever the bees decided to go I hope they survive the winter and come back next spring. 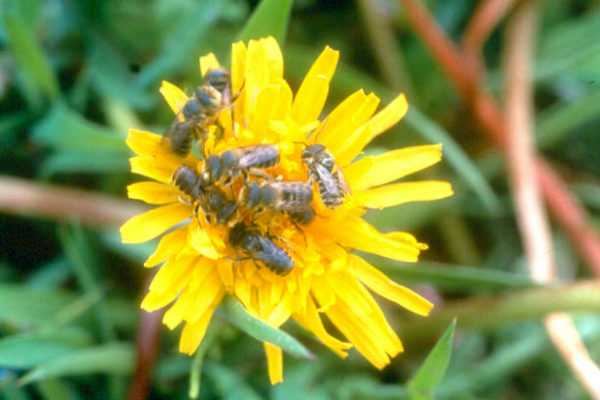 I am curious though what you or others have done to have good retention of leafcutter bees? 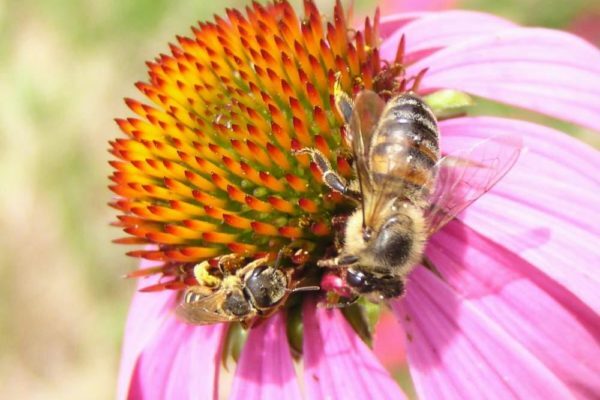 Anyway, it was very fun to have them as summer bees, and I definitely would order more leafcutter bees from you next spring and try a few different things. 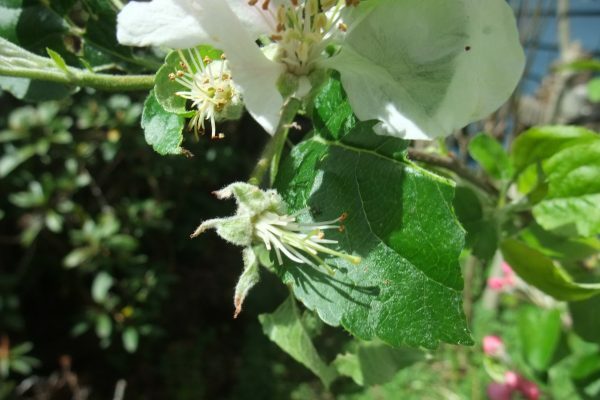 I have also taken a lot of video of the leafcutter bees on our flowers, and when I have time I plan to process the video to extract some still photos to send to you. source of bees than most bees produced in the United States. 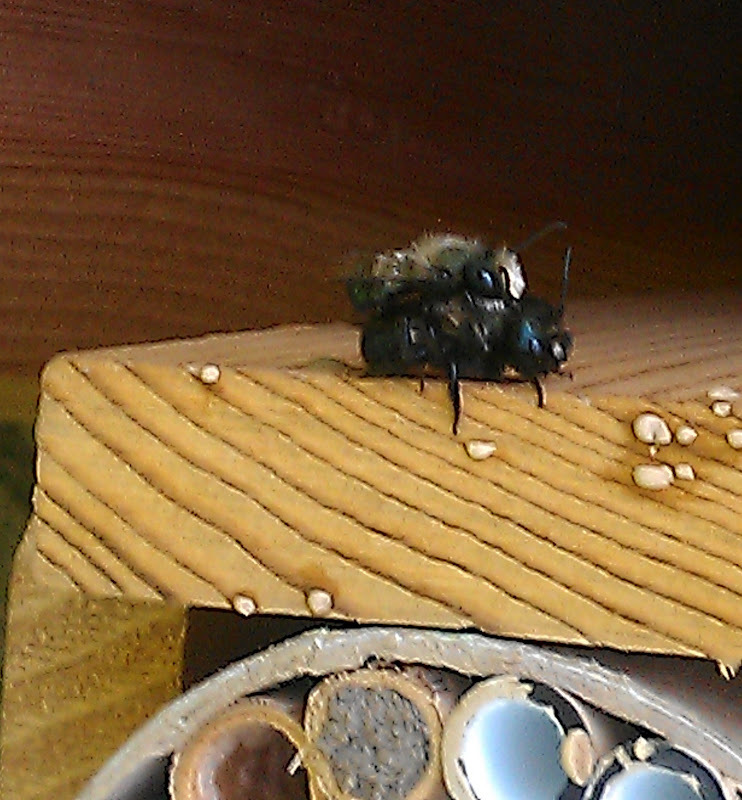 What Mason bees are these? 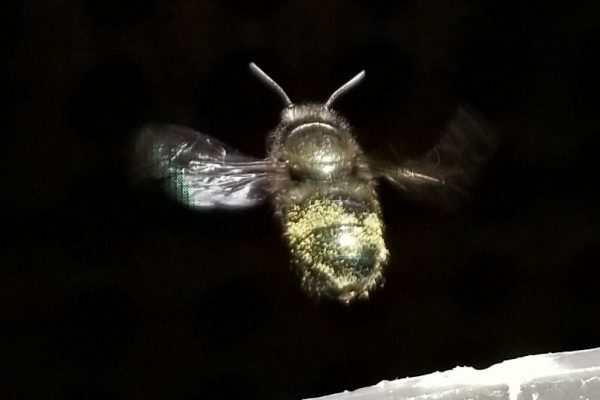 I’ve been keeping mason bees for four years now and earlier this month I came across something I have never seen/read/heard about before. 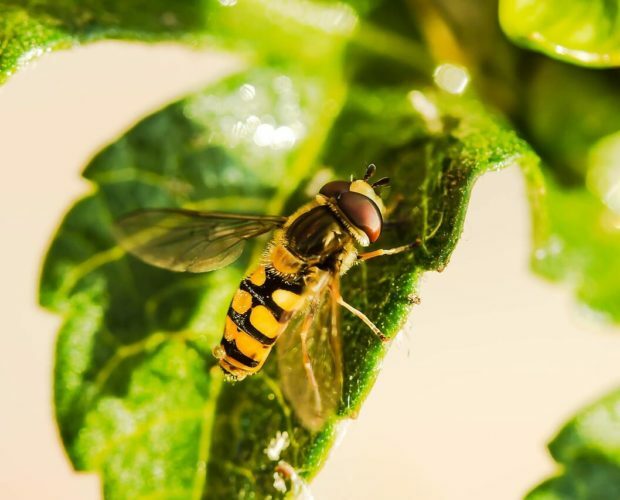 One afternoon I noticed a big bumblebee — a big bugger, about twice the size of a mason bee with a tiger-striped orange abdomen — hanging around my mason bee houses and fussing about at the end of one of the tubes. I later observed the same bumbler entering already occupied tubes on more than one occasion. I figured the bumbler was simply stealing the pollen already gathered by the mason bees — you know: working smarter, not harder. 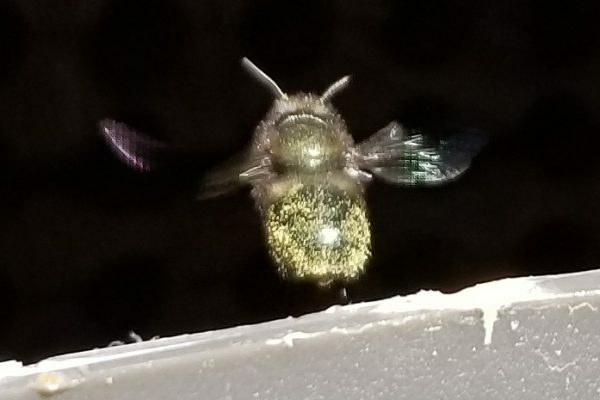 Then one evening I was checking the mason bee house with a flashlight and noticed that in four of the tubes, there was a thick, viscous liquid inside. The taste test doesn’t lie — it was honey. 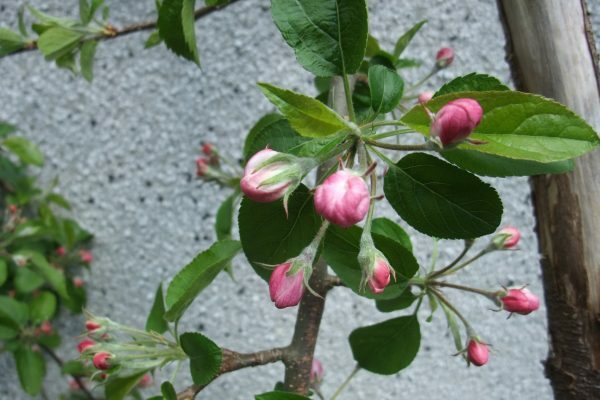 I emailed Margriet and asked some of the questions running through my mind: Is this common? Do bumblebees hijack mason bee tubes for themselves? 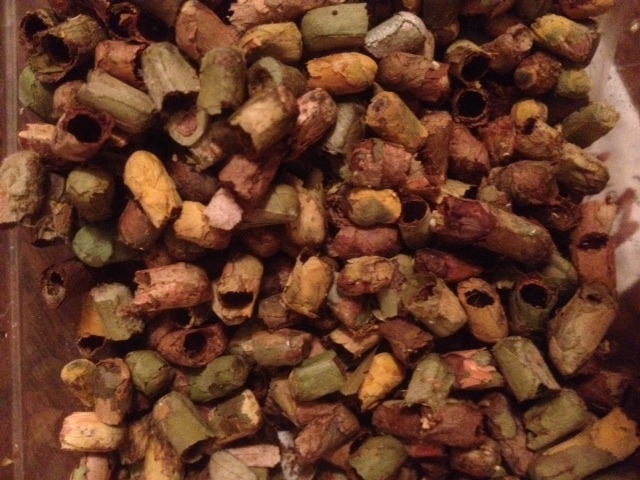 I already have 20 tubes filled up so I have more than enough mason bees for next year. I’m no interest in killing the bumbler but its behaviour was fascinating. Since then I did some research and, combined with my observations, I have concluded the bumbler in question is an orange rump bumblebee queen (Bombus melanopygus) who has apparently made an odd choice for a nesting site (image: Queen). 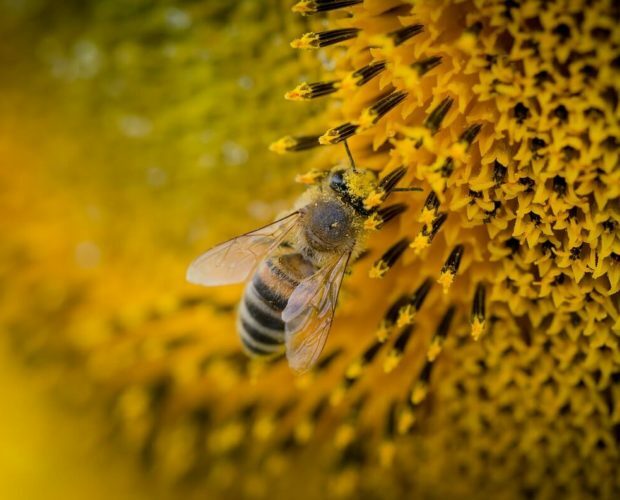 She had taken possession of a row of four mason bee tubes, each of which contains globs of honey. If you look inside the tubes in image: honey, the little gleams of light are actually the blobs of honey. (I have a better shot of the honey but I can’t get my email to work on my iphone right now). 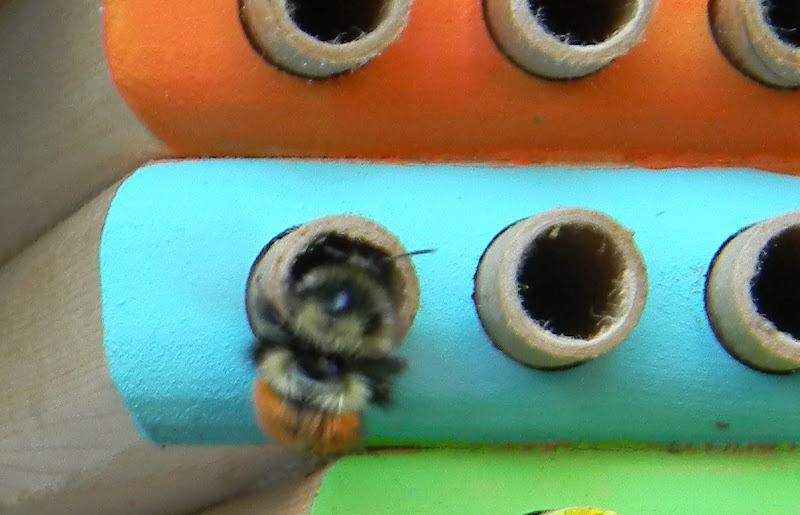 She goes in and out of the tubes but has to back out of them because she is too big to turn around inside like a mason bee can. One evening when I returned home from work I was lucky enough to watch as the queen used her wings to fan the entrance to one of the tubes (image: bumbler1A). 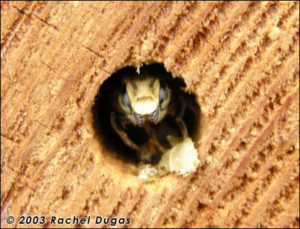 I’ve read about honeybees doing this at the entrance to a hive so it was interesting to see. When she was finished, I was able to get the second shot (image: bumbler 2). There are also now a couple of worker orange rumped bumblebees on site and one of them has taken possession of another tube. They are much smaller — but still bigger than a mason bee — with just a dab of orange on the end of their butts. I have two mason bee houses located side by side but the bumblers show no interest at all in the other house. The bumblers are now very active as you can see by the heavily stained appearance around the end of their tubes (image: tubes). I believe this is caused by dirt and pollen tracked through the honey by the busy bumblebees. They are still producing honey. 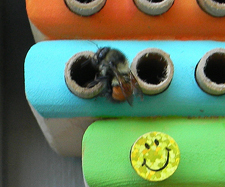 From all appearances, the bumblebees have set up shop in the empty mason bee tubes for the remainder of the summer. I have 10 empty ones left so there still room for expansion. Michael emailed me with a question on setting out new nests when the old nests are getting filled. He asked if adding a nest close to the others would disorientate the bees already nesting at the location. I suggested that additional nests are best set out in the visual range and clustered close to the original nests. Michael also noted that his bees headed for the tubes first. 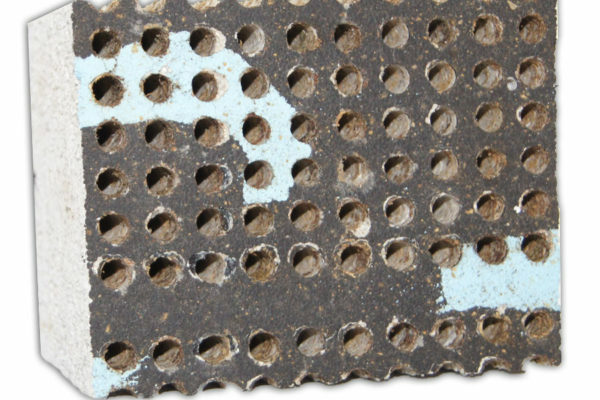 Yes mason bees prefer round holes, especially when the substrate is wood or carboard. Unfortunately the bees’ choice is not always the best for eaze of management. 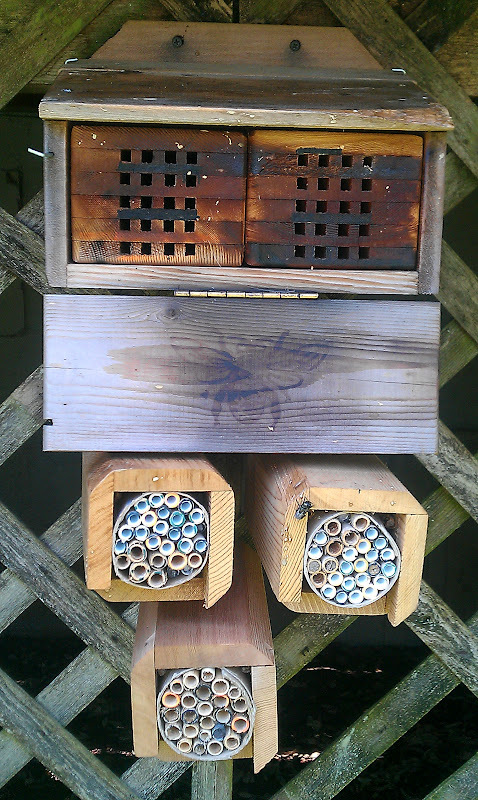 If I need to set out more nesting sites for the Mason bees should I put them next to existing sites, or, put them a bit away from the one’s I originally set out? The reason I ask is that I am getting many more bees to nest so far this spring compared to last year but I do not want to mess up the bees visual cues to the old sites. I also know they like to be near each other. Your thoughts? As I mentioned before I was particularly surprised by what happened this spring when most of the O. lignaria emerged at once with a very low dispersal rate. This activity was in contrast to the last two springs where the dispersal rate was high and emergence rates were very sporadic. 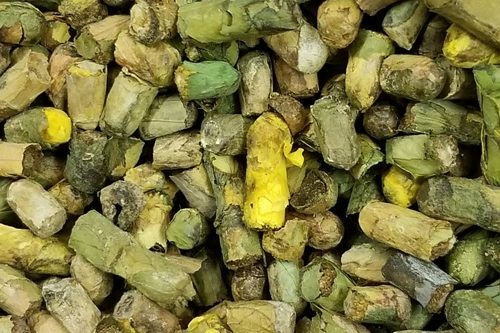 In my nesting set-ups, which I have two of them around my house (see the BEFORE photo), I put 40 cocoons in the wooden house, and 20 cocoons in each of the tube units (80 total of O. lignaria). There was also 20 of your O. californica cocoons in the wooden nursery house. 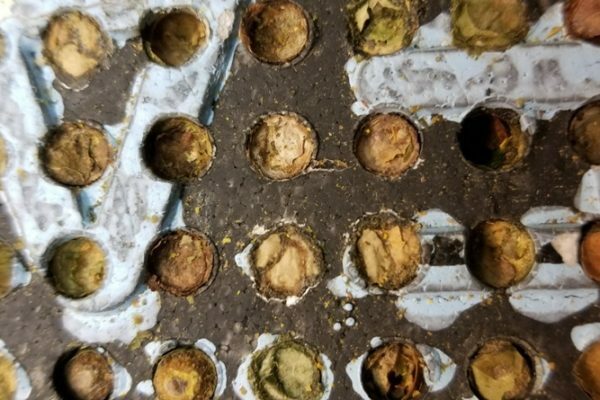 I set out all of my bees on April 20 and to my astonishment, almost all of O. lignaria had emerged by April 22, and the first mud nests were made in the tubes on April 24. The second surprise was that all of the bees decided to move to the tube units (reeds and paper filled tubes). This is where I was beginning to get concerned that I would not have enough nesting sites. We had a week of very good weather, and then we had four-five days of cool and damp weather which I then decided to put another tube unit below the existing two tube units (see AFTER photo). 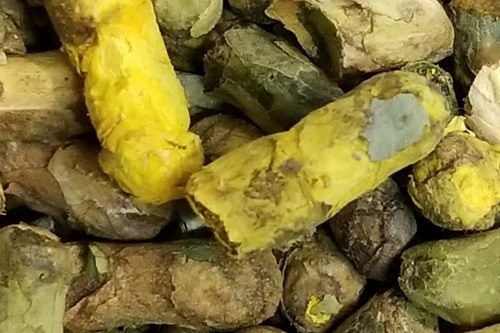 During this cool period of weather, I noticed that all the O. lignaria bees were resting in the tubes, so I kept track of what bees were in what tubes and how far they had gotten along in building their mud nests. The good news is that when the good weather returned last weekend that all of the existing bees resumed their normal activity and were not deterred by the NEW unit below! It seems that putting a new nesting house nearby did not distort their visual cues (at least under my conditions). Also, in taking the pictures of my nesting sites last weekend I noticed the O. californica I purchased from you were beginning to emerge. I just managed to snap a photo of a O. californica male and female bee doing what a pair of bees are supposed to do . It might also be my imagination but it appears that the O. californica seem a bit larger than the O. lignaria, and so far all the O. californica bees are headed for the tubes. 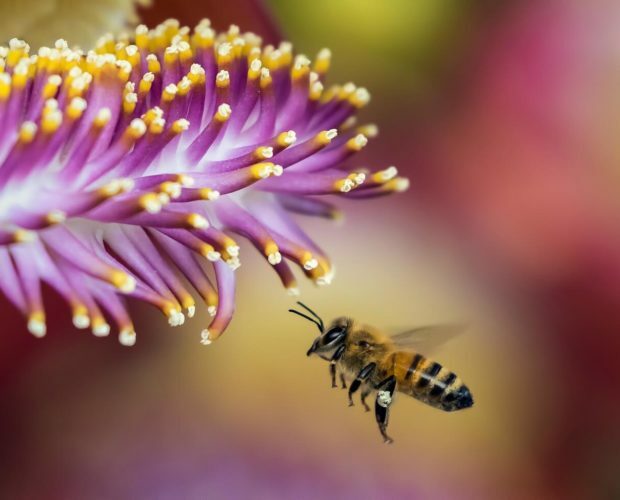 Maybe it is some kind of social communication or interaction, but who knows what the bees are really thinking! 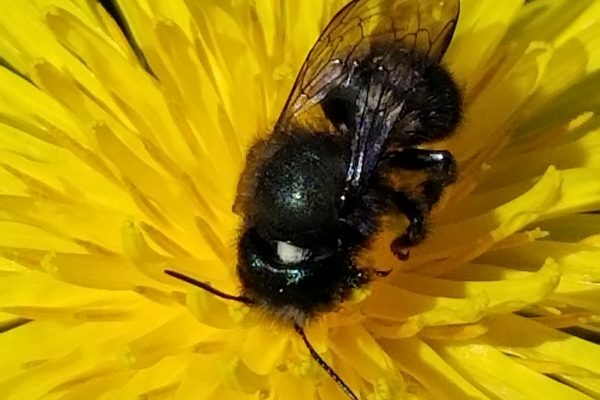 Osmia californica comes out late in spring, often their emergence overlaps the latter end of the Osmia lignaria (early spring mason bee) season. However very little is known about them. If you’d like to share your photos of Osmia californica, please email them to me and I will get them on this blog.